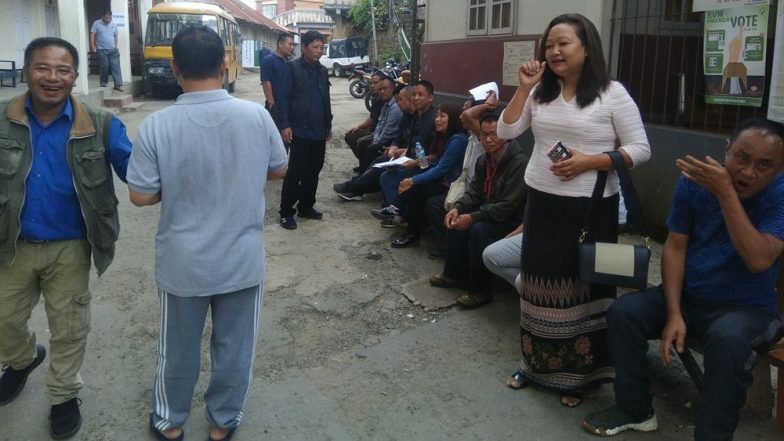 Aizawl, April 11: Over 62 per cent of the 7,87,777 electorate cast their votes on Thursday for the lone Lok Sabha seat in Mizoram under heavy security cover, a top official said. The state's Chief Electoral Officer Ashish Kundra said that over 62 per cent voters had cast their votes by the end of polling at 5 p.m. since voting began at 7 a.m. across 1,175 polling stations. "Voting has been absolutely peaceful and smooth. Conducive weather helped people to exercise their franchise without any trouble," Kundra told the media. The voters will decide the electoral fortunes of six candidates, including independent aspirant Lalthlamuani, who is the first woman candidate contesting parliamentary polls in the northeastern state. Besides polling for the lone Lok Sabha seat, a by-election for the Aizawl West-1 Assembly seat was also underway on Thursday. The by-election was necessitated after the legislator of Zoram People's Movement (ZPM), Lalduhoma vacated the seat to retain his Serchhip constituency. The parliamentary constituency in Mizoram, reserved for Scheduled Tribes, is set for a multi-cornered contest. Andaman and Nicobar Lok Sabha Elections 2019: Phase I Voting Ends for Andaman and Nicobar Parliamentary Constituency, 70.67% Voter Turnout Recorded. However, according to political analysts, the main contest is between the ruling Mizo National Front (MNF) candidate C. Lalrosanga and Lalnghingolva Hmar, jointly fielded by the opposition Congress and the ZPM. The Bharatiya Janata Party (BJP) has fielded veteran tribal leader Nirupam Chakma, a former Congress minister who joined the BJP a few years ago. People's Representation for Identity and Status of Mizoram (Prism) -- an anti-corruption watchdog-turned-political party -- has fielded T.B.C. Lalvenchhunga, a young retired Naval officer. Lal Hriatrenga Chhangte, another independent, makes it a six-cornered contest. Abeda Nanda Baidya, Sub-Divisional Magistrate of northern Tripura's Kanchanpur sub-division where some of the refugee camps are located, told IANS over phone that around 3,000 of the 12,081 Reang tribal refugee voters went to Kanhmun in Mizoram to cast their votes while others were reluctant to do so. The poll panel has also asked the Tripura government to provide logistical support including transportation and security to the Reang tribal voters from their seven relief camps to Kanhmun. The 12,081 tribal refugee voters are among the 35,000 emigrants living in the seven relief camps in northern Tripura for the past 22 years after they fled their homes in three Mizoram districts in the wake of communal tension.